PLAYA DEL CARMEN, Mexico (AP) Matt Kuchar had gone four years, six months and three weeks since his last PGA Tour victory. The last few holes Sunday at the Mayakoba Golf Classic must have felt just as long. Kuchar started the final round with a four-shot lead and made only two bogeys in the first 67 holes he played at El Camaleon Golf Club. And then he made back-to-back bogeys, Danny Lee holed a birdie putt from off the 16th green, and Kuchar had no margin for error. He finished with three pars, making nervy 3-footers on the last two holes, to close with a 2-under 69 for a one-shot victory and a big sigh of relief. 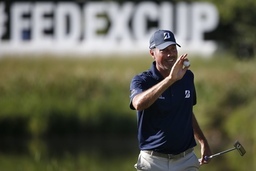 "I didn't want a 3-footer on the last hole," Kuchar said. "I was hoping to have a three or four-shot lead for some wiggle room. But man, that felt awfully good." Lee, the only player to sustain a serious threat against Kuchar, finished with two pars for a 65. Kuchar still wasn't entirely in the clear. His 15-foot birdie attempt on the 17th rolled about 3 1/2 feet by the hole, and he had to make that for par to stay in the lead. And on the final hole, he left his 30-foot birdie putt about 3 feet short and had to roll that in for the victory. "That was some of the best ball-striking I've had, and through 60 some holes, awfully good putting," Kuchar said. "And then the putter kind of went a little bit on the fritz there coming in. Thrilled to be the champion here. It's been a long time for me. It feels extra sweet right now." The 40-year-old Kuchar had gone 115 starts on the PGA Tour since his last victory in the RBC Heritage at Hilton Head in April 2014. It comes at the end of what had been a disappointing year in which Kuchar finished out of the top 70 on the PGA Tour money list for the first time since 2007, and he failed to make the Ryder Cup team for the first time in 10 years. "My 2018 wasn't what I wanted," Kuchar said. "This is a high note. It's amazing thing to get a win. I go from `Hola' to `Aloha.' I'm pretty excited about that." Kuchar qualifies for the Sentry Tournament of Champions to start next year at Kapalua. He finished at 22-under 262, breaking by one the 72-hole record at Mayakoba previously held by Harris English. PGA Tour rookie Cameron Champ had a 12-foot eagle attempt on the 13th hole that would have brought him within two shots, but he missed the putt and sent his next tee shot into the mangroves, making double bogey. He had another double bogey on the 17th hole and had to settle for a 69 to tie for 10th. J.J. Spaun (66) and Richy Werenski (67) tied for third. Ryder Cup captain Jim Furyk closed with a 67 and was among those who tied for sixth. Kuchar won for the eighth time on the PGA Tour in a career marked more by consistency than trophies. This year, he had neither. He had only four top 10s - his best finish was a tie for fifth in Phoenix - and was coming off a tie for 57th in Las Vegas. He added Mayakoba at the last minute, and with his regular caddie having previous plans, Kuchar hired a local caddie from El Camaleon. He referred to the week as a "working vacation" because of the beaches and amenities at Mayakoba, though it felt like work at the end. "Golf is such a funny game," Kuchar said. "It's hard to predict when it's going to come around."